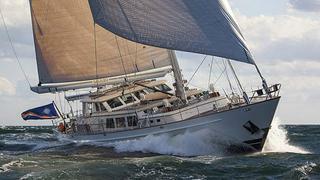 News in overnight from Michael Nethersole at Northrop & Johnson of a $500,000 price drop on the 37.5m ketch-rigged sailing yacht Galileo. Built by Palmer Johnson in 1989 to a design by Sparkman & Stephens, she features an elegant, understated interior by John Munford accommodating six guests in a master suite, double stateroom and twin cabin. Currently located in St Maarten, Galileo is down from $6.45 million to $5.95 million.